"Peaks Island is the most populous island in Casco Bay, Maine. It is part of the city of Portland and is approximately 3 miles (4.8 km) from downtown. The island became a popular summer destination in the late 19th century, when it was known as the Coney Island of Maine, home to hotels, cottages, theaters, and amusement parks..."
"Once known as the Coney Island of Maine, and later an important WW II outpost, Peaks Island today is a neighborhood within the city of Portland. 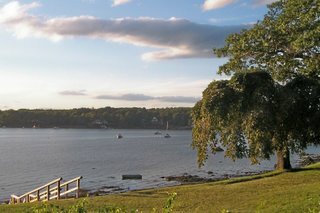 Home to artists, retirees, commuters of all sorts and a substantial summer population, Peaks Island boasts a small town feel with unparalleled ocean views and access. Fourteen daily departures (20 minutes one way) from Portland make Peaks an ideal, family friendly destination..."
Rob is a self-described "corporate world refugee who traveled too much, attended too many meaningless meetings, participated in too many disputes and now, just wants to be quiet and watch..." He has some spectacular photos of special places on Peaks Island, like the one to the right, and the one at the top of these pages. This map of Peaks Island marks the major landmarks and beaches. It's good for cycling because you can tell which roads are paved. Also it reveals where some of the unpaved ones that look like driveways are actually public ways. "The Fifth Maine Regiment Memorial Hall was built in 1888 as the "Headquarters" of the Fifth Regiment Maine Volunteer Infantry 1861-1864. For nearly sixty years the veterans and their families summered here, enjoying the cooling ocean breezes and magnificent view from the verandah of their beloved cottage. 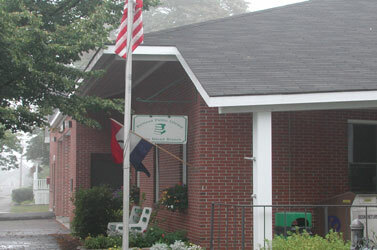 Under the stewardship of the Fifth Maine Regiment Community Association, the Hall is maintained as a Civil War and local history museum and a cultural center for our island community. We hope you enjoy your visit to our web site..."
"The living history experience provided by a vacation at the Memorial Building is a truly unique opportunity to enjoy the hostel style, communal living experience as the veterans designed it. The Memorial Building is a licensed lodge with 13 guest rooms for those interested in a late 19th century period vacation and immersion in history. Since the days it was constructed, the building was a site for the veterans to reconnect to their fellow soldiers in a beautiful setting. 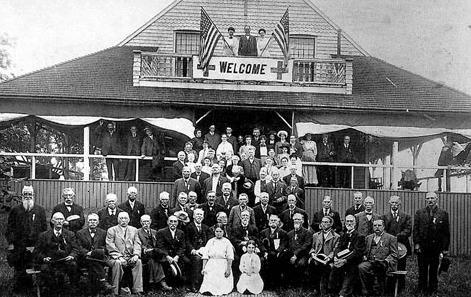 The Memorial provides a taste of the fellowship that the vets shared..."
"The site was known as the Peaks Island Military Reservation. The Army first used the site in the early 1900's. During World War I the Army built a searchlight shelter, a generator building and one bunker as part of the Portland Harbor Defenses. 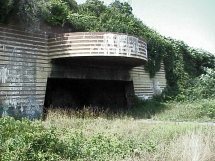 During the World War II era the Army constructed Battery Craven, Battery Steele, a control bunker, and five observation towers at the site. The site was not under other than DOD control during the period of DOD use." "You know that little pocket that comes on a new umbrella when you buy one? It's like a sleeve made out of the same material as the umbrella. . . That's an umbrella cover. The Umbrella Cover Museum is dedicated to the appreciation of the mundane in everyday life. It is about finding wonder and beauty in the simplest of things, and about knowing that there is always a story behind the cover." "Peaks Island Tours has been offering its highly praised tours to local area daytrippers, �people from away�(a Maine term), and islanders returning to their roots for six years. It has always provided a money back satisfaction guarantee and much to its delight it has never returned a dime. We look forward to being your host!" Brad's & Wyatt's Bikes does not have its own web site, but this link goes to a review. It includes the hours and the phone number to call for rates. "Since 1986 Maine Island Kayak Co has provided unusual journeys, structured courses, and great trips among outer islands of the world. And we�re always up to interesting things - so make sure to check our calendar and events area for great events..."